"An adventurous programme by a gifted artist ... beautifully phrased and pedalled ... a great performance ... this was some of the finest Beethoven playing I have heard in years. Every aspect of the score was realised ... immensely powerful." "Christopher Langdown is one of the UK's fastest-rising stars of the keyboard and is destined for a long and glittering career as one of the world's top pianists." "Christopher Langdown's programme at Wigmore Hall was certainly a demanding one, but a challenge to which he rose admirably. Throughout the evening, Langdown's playing was exemplary ... with such undoubted musicality and total pianistic technique at his disposal, we looked forward to Langdown's own work, Deo Omnis Gloria, a striking and original piece of positive and compelling expression which was also extremely well laid out for the instrument. Needless to say, the performance was thoroughly convincing." 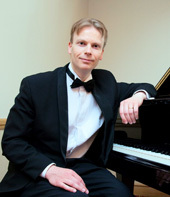 "Christopher Langdown has a lovely tone, smooth legato and a technique equal to the pianistic challenges in this programme. A really good pianist." "Langdown demonstrates a technical control and a flair for the style that is second to none. His playing reminds me of the young Cliburn. Strongly recommended." "Very impressive. A mind that considers every detail yet carefully avoids any feeling of the ordinary or academic." "His programme was large and varied...but it got even better in the final Rachmaninov work, which was supremely impressive. The sonority and thick chordal texture was given its due weight and the driving energy with which it alternated was quite astonishing, demanding both power and agility from the pianist. Christopher Langdown supplied both." "Mr Langdown's brilliant, flowing technique made a big impression. He played throughout with sensitivity and finesse, bringing a real sense of poetry to his performance." "Pianist Christopher Langdown and the Fitzwilliam String Quartet went on to give a gripping account of the quintet, properly Brahmsian in its surging, dense textures and sequences. Langdown's full, rich tone was matched by string playing of near orchestral intensity." "A recital of note-worthy calibre ... skill and musicality were again married to provide a fine interpretation characterised by attention to mood, rhythmic interest, perfect pedalling and, once again, impeccable articulation enhanced by stylish, tonal shading. This final feature seems to be Langdown's hallmark, a feature that contributes to the interest of his interpretations. Langdown revealed admirable stamina...furthermore he confirmed his accomplishments through fine pianism and technical wizardry combined with a deep understanding of the subtleties presented by the score. The Romantic in Langdown was highlighted in the encore - his own composition called Resurrection that permits a display of brilliant technique together with musical sensitivity. Langdown's performance was a noteworthy one...he played to a highly appreciative audience that would definitely welcome the pianist again in the future." "He played with unerring skill, creating a veritable tour de force. A truly memorable concert of piano music." "This was an outstanding recital, greatly enjoyed and acclaimed by a delighted audience." "Langdown was master of the occasion at all times, dedicating himself completely...the soloist brought out the required technical and expressive line that his imagination urged him to portray."